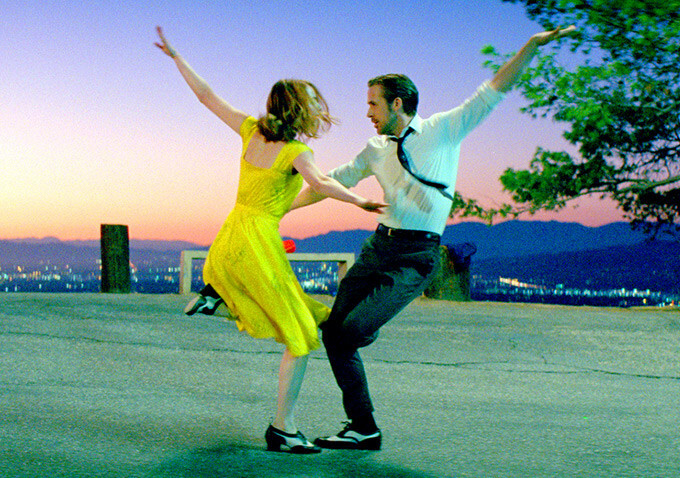 Go ahead, try not to fall in love with La La Land. I dare you. Being a fan of movies is both rewarding and frustrating. We love big, grandiose Hollywood cinema, but far too often it seems like Hollywood doesn't love us. We're served up one stale, formulaic blockbuster after another like they were rolled right off a conveyor belt. La La Land might be the cure to all of that, though. A lovely, sweeping original musical told in a kaleidoscope of bright colors, paying tribute to the glory of old Hollywood productions while existing in a modern space. It is a remarkable achievement, as light on its feet as it is grounded and real, this is the kind of musical that makes fans of those who hate musicals. After two hours you are guaranteed to leave the theater with a bit more pep in your step, but don't think for a second that director Damien Chazelle, in his follow-up to the jazz drumming thriller Whiplash, is creating an airy puff piece. The story he's telling is a familiar one that has been part of the fabric of Hollywood since the beginning. The indomitable duo of Emma Stone and Ryan Gosling are aspiring actress Mia and jazz enthusiast Sebastian, both trying to find their way in a business that chews up people like them by the millions. Yes, it's a movie about dreamers, those who risk all to achieve that which they have always wanted. Seen and heard it before? Sure you have. But any notion you've seen it quite like this goes away with the soaring, heart-swelling dance number welcoming you to L.A. in all of its "Presented in Cinemascope" glory. It grabs you by the collar and demands, "So you don't like musicals, eh? Well check this out." But Chazelle isn't just content to simply be an homage; he's actually trying to tell a story here, a romance naturally. And it's a love story about more than just Mia and Sebastian's relationship, it's about the very nature of lofty aspirations. Mia works as a barista on a studio lot, quietly pining to be like the actresses who come in and order coffee every morning. She rushes off to one disappointing audition after another whenever she can, then rushes off to more. Seb is an old soul trapped in Ryan Gosling's body. He's a lover of old school jazz, a pianist who hopes to start his own club where the traditions can be maintained. Their first meeting is too perfect and not at all hopeful, it's like the anti-meet cute. But subsequent encounters begin to take on an air of inevitability. One Fred Astaire/Ginger Rogers dance number and the two are inseparable; Mia inspiring him to save the jazz sound he loves, and him encouraging her not to give up. We've seen Gosling and Stone together before in two movies, Crazy Stupid Love and the forgettable Gangster Squad. They really do feel like a modern-day Astaire/Rogers duo, and watching them fall in love has become quite comfortable yet also completely irresistible. Their romance here is utterly hypnotic, singing and dancing through a series of unforgettable numbers, each with a different flavor than the one before. And Chazelle bravely embraces some of the fantastical qualities inherent to Hollywood musicals, in particular during a heavenly sequence where Mia and Seb literally float on air at the Griffith Observatory. It's a delicate balance Chazelle has to walk, but what makes La La Land such a complete joy is how well he pulls it off. It's not all happy days and nights for the couple. There's a great deal of pain and uncertainty, which Chazelle doesn't shy away from. For Seb, the question of his integrity is raised when his music career takes off with the help of a friend (John Legend), but playing a style of jazz he's always resented. Does he ditch the fame and the money just to be true to his values? Mia faces a different dilemma altogether, one in which she must consider the possibility she isn't good enough. The whim and impulse of the beautifully choreographed dance numbers are matched by the gravity of Stone and Gosling's performances during the poignant moment. This is such a huge step up for Chazelle that it's amazing how easy he makes it look. Even the bittersweet ending, which I think will be divisive to those hoping for a more definitive resolution, earns every single emotional beat. 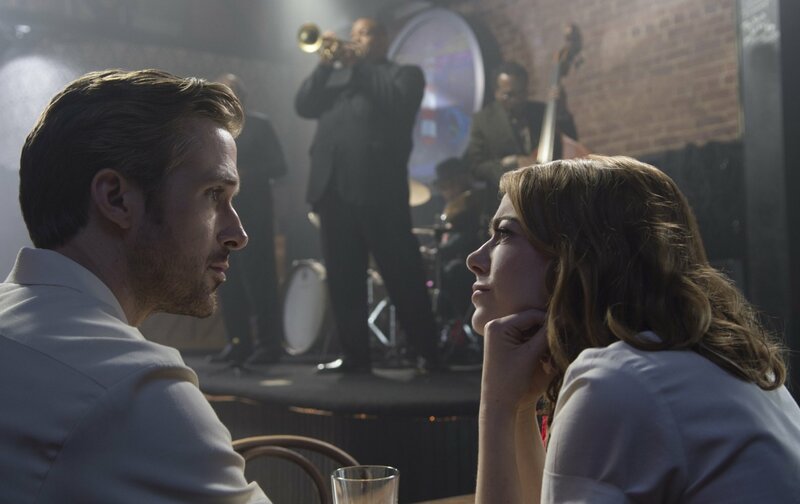 However you feel about the way things shake out, you will definitely feel something by the end of La La Land. It manages to encapsulate through song and dance the entirety of our eternal love affair with music and cinema.